When people ask why I enjoy setting tablescapes so much I tell them I am not artistic at all. I truly can screw up a stick figure! But, when it comes to setting a 'scape, I think of the table itself as my canvas. Coming up with ideas and themes allows my inner artist to come out in a different way than with paint and brushes. That is what this setting is that I share with you today. One of my masterpieces if you will. The muse for this piece of art came from these melamine plates I recently found at World Market. I am a big fan of Impressionism art and one of my favorites is Monet. When I saw these dishes I thought of one of his most famous pieces, 'Water Lilies'. Inspired by his own gardens, his paintings reflected the beauty he had created in real life. 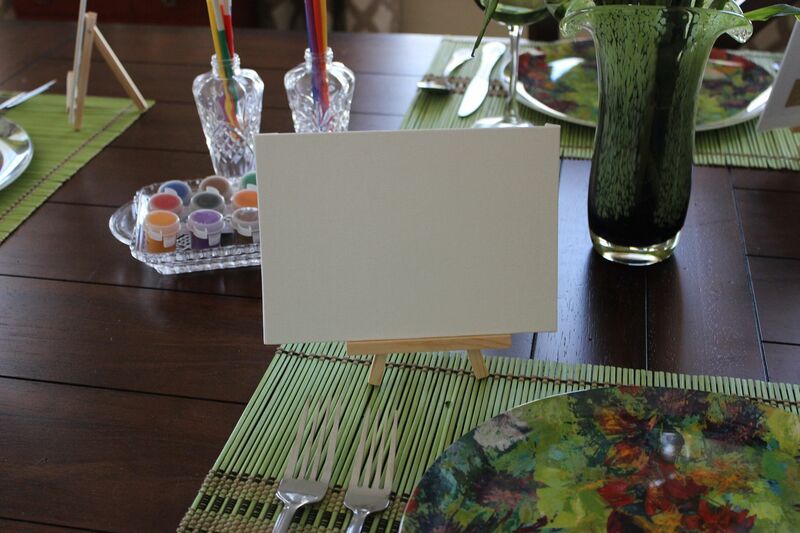 I wanted the rustic wood of my table, aka canvas, to be evident so, no tablecloth was used. My mother-in-law had gifted me the placemats and they anchored the plates beautifully. I picked up some small easels and canvas at Michael's and placed one at each setting. While at Michael's, I also picked up some watercolor paints and brushes so that my guests could create their own works of art. 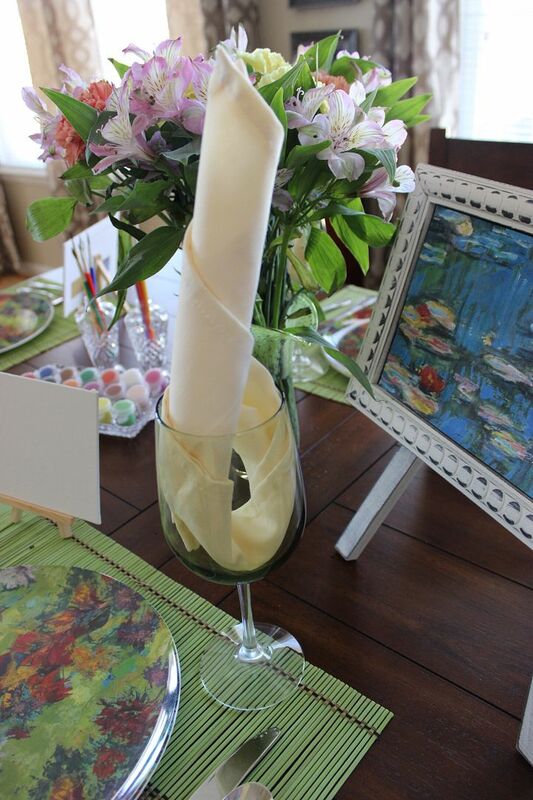 Wine goblets from Dollar Tree hold a towering cream napkin. I like the way the napkin flows through the glass, much like a swan on water. 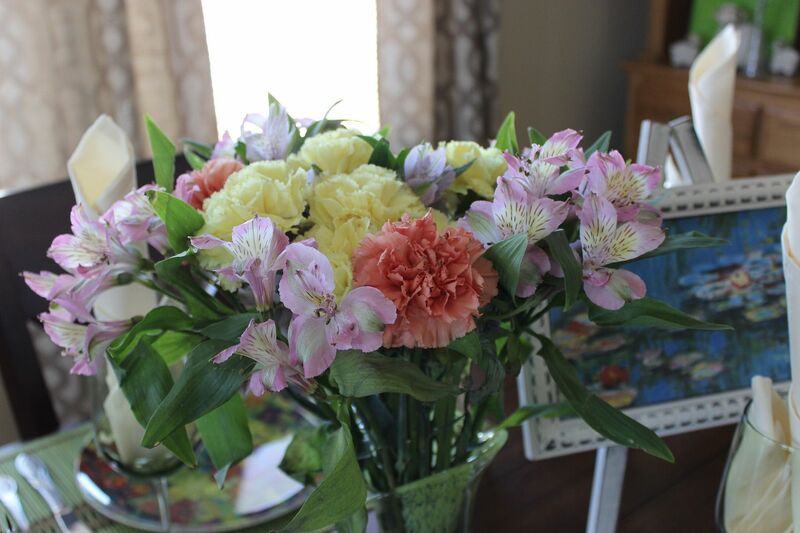 Some markdown flowers from the grocery store were placed in a vase that Mr. B got me years ago. 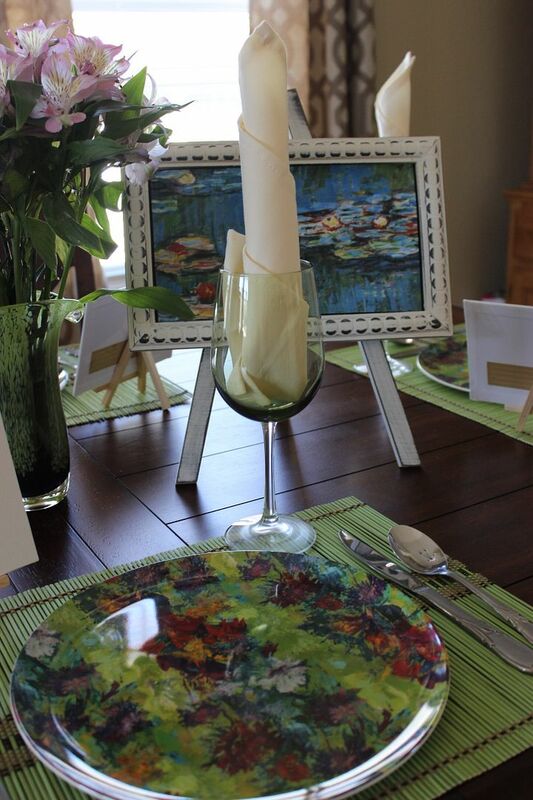 How fitting for this table that it is called, Monet. The flowers reflect the colors found in the plates. 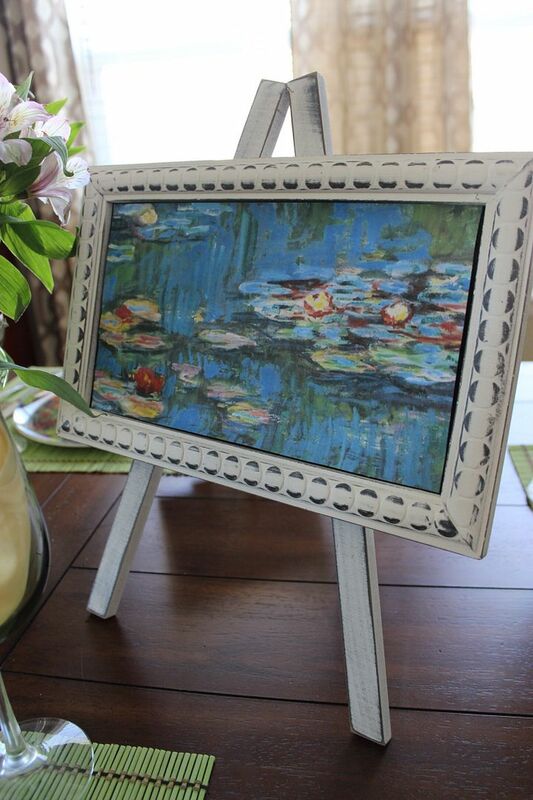 I found this wonderful easel on deep clearance at Michael's. It is actually a chalkboard but, I printed off a print of 'Water Lilies' from the internet and used glue dots to attach it inside the frame. So, while I am not an artist in the traditional sense, and my work will never be displayed in some museum, I love creating works of art on my table to enjoy and to share with you. Excellent idea! The plates fit perfectly. Love it, good job Picasso! 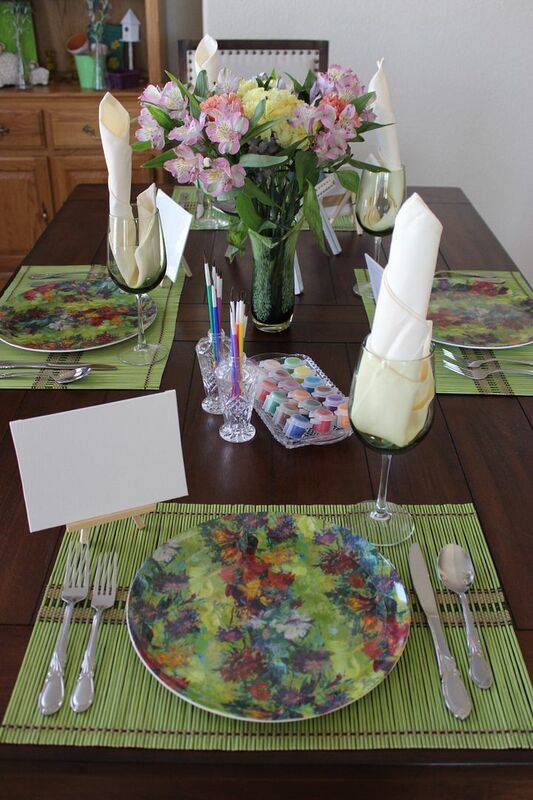 What a pretty picture you have painted with your tablescape, Kathe. I think it is the perfect summertime canvas! What a fun table! I love the blank canvas for each guest to paint!! The vase is lovely! I love the art of Monet and was lucky to see some while i was in Paris. 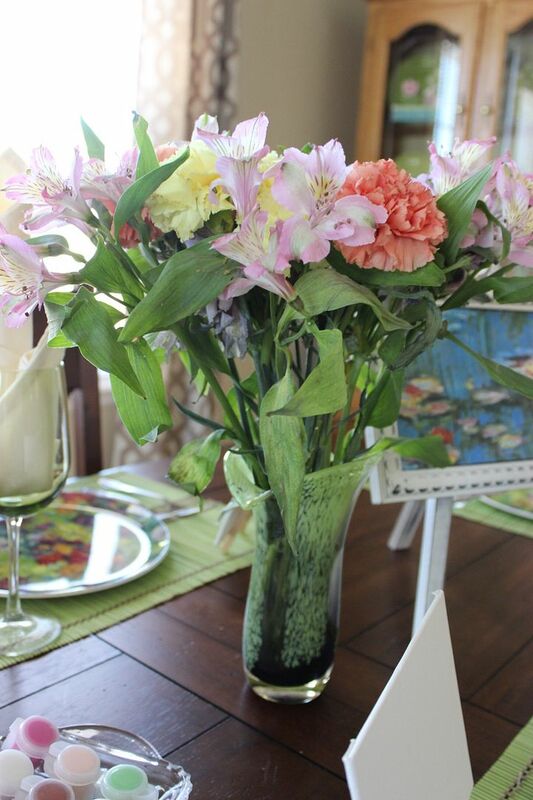 Your table brings the colors perfectly to a tablescape! I am so impressed. So creative with adding the canvas at each place with paint and brushes for creating. Such an original idea. 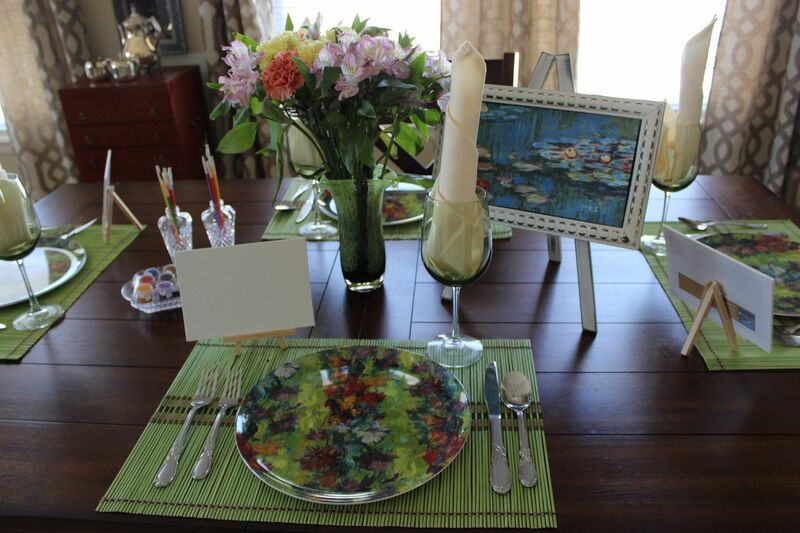 Your tablescape is just lovely, Kathe! The dishes are stunning and I can see why they were your muse. By the way, I'd love to have you post on my new blog hop—The Weekend Blog Hop at My Flagstaff Home (www.myflagstaffhome.com). It begins on Thursday evenings and lasts through the weekend, if you're interested. Very artistic Kathe! 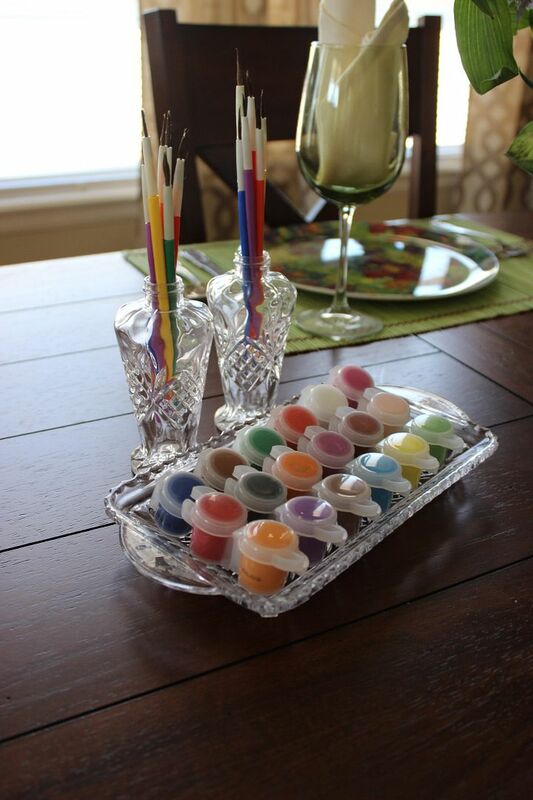 the watercolors are the perfect touch along with your Monet print to wash your artists table in a rainbow of colors! Those plates are lovely and the way you've styled the table around them is divine. Great idea of incorporating the paints...lovely table! What a great idea. The plates are lovely. 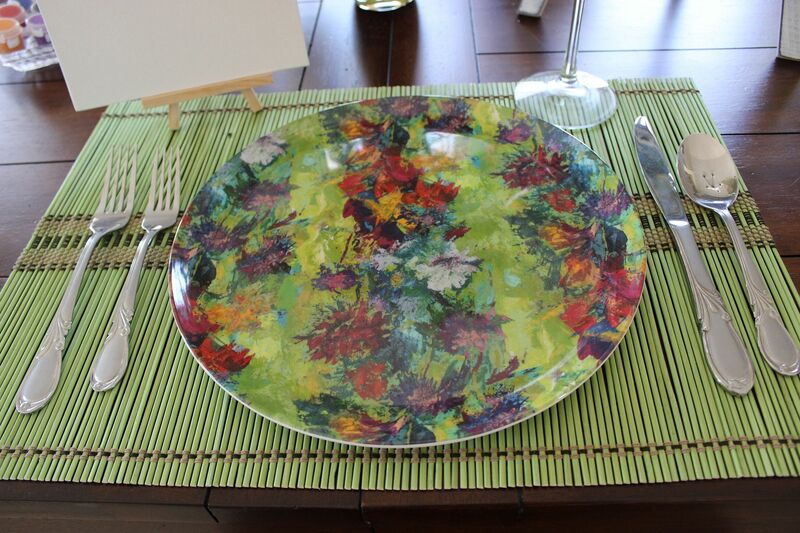 I've been looking for some melamine plates and will be checking out your source! Thanks for joining Foodie Friends Friday! What a wonderful table Kathe! I love the idea of recreating the feel of Monet for a tablescape. The napkins in the wine glasses do remind me of swans. Swans swimming by the little lily pads in Monet's painting. You are certainly an artist in your own right! Thank you so much for sharing at SYS and wishing you a great week! What a pretty table setting! I like what you have put together - especially that plate! I came over on the Titus 2 Tuesday Link up. I'm glad to meet you and find your blog. 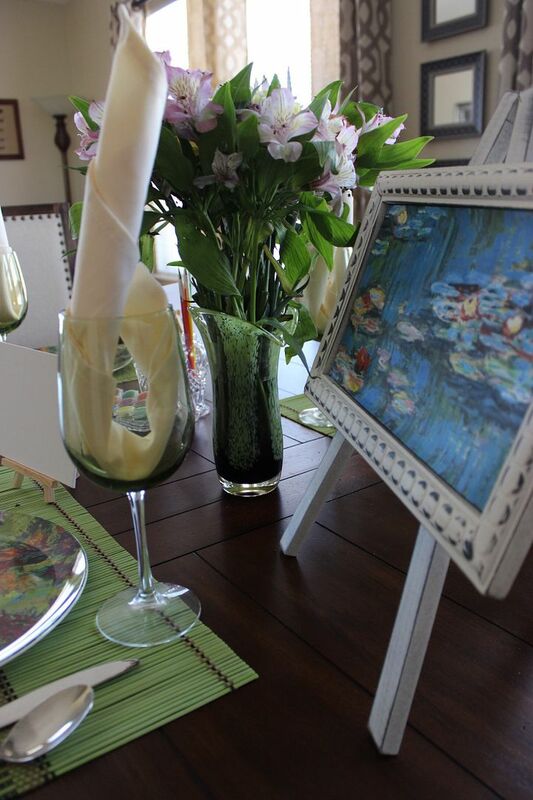 Kathe, you definitely are an artist when it comes to creating tablescapes! 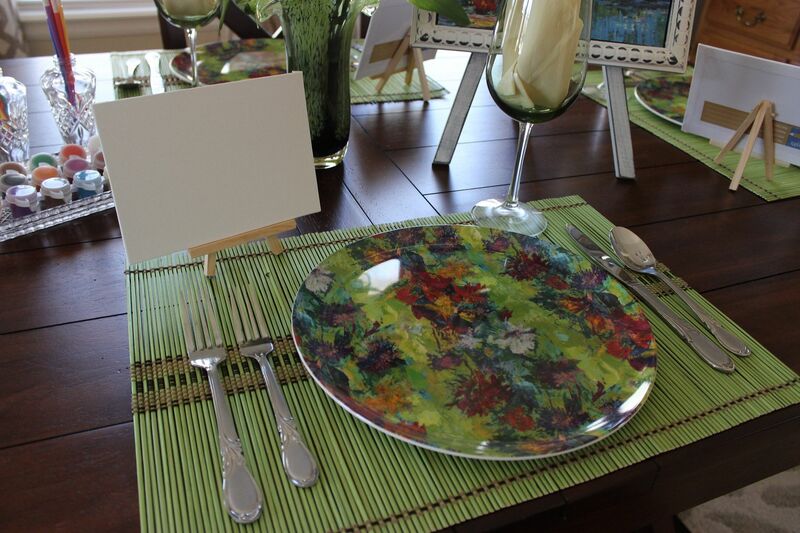 The placemats are perfect and I love how you set the table encouraging your guests to create! Thanks for sharing with SYC. How Pretty!! Thanks for Linking up on My 2 Favorite Things on Thursday!! Hope to see you again tomorrow!! I love having You!! Pinned!! Very nice Kathe! Thanks for joining Home Sweet Home! 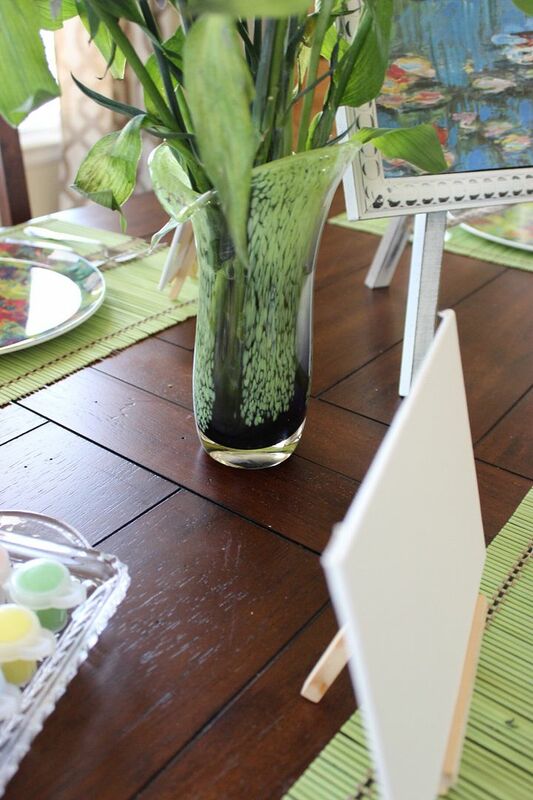 Thanks for sharing this lovely tablescape. Kathe, this is a clever idea. I'm going to remember this for a group of friends who are all artists. Great idea! You're Gonna Love It Party Time! You're Gonna Love It~Hello June!